This bug occurs in Firefox but is likely related to the generic Gnome file-selection-dialog rather than application specific. Due to the amount of file formats we're filtering based on, the dialog box can easily grow wider than the user's display permits. Expected behavior would be to truncate the file filter list display past a certain point to prevent dialog box from growing too large. Our testing confirms this behavior in both Ubuntu 7.10 and 8.04RC. This bug prevents Ubuntu users from being able to use the advanced upload tool on Flickr.com from Firefox. reassigning to gtk+ for now as ffox uses gtk dialog nowadays. I've noticed this trying to upload to Flickr, something which a lot of users are likely to do, so this is a very relevant bug. Such an annoying bug, the only 'paper cut' I was absolutely sure of. The non-parenthesized text in the file type filter combo box is going to be descriptive enough in most cases, and users will practically always try to pick the target file before checking the file type filter. 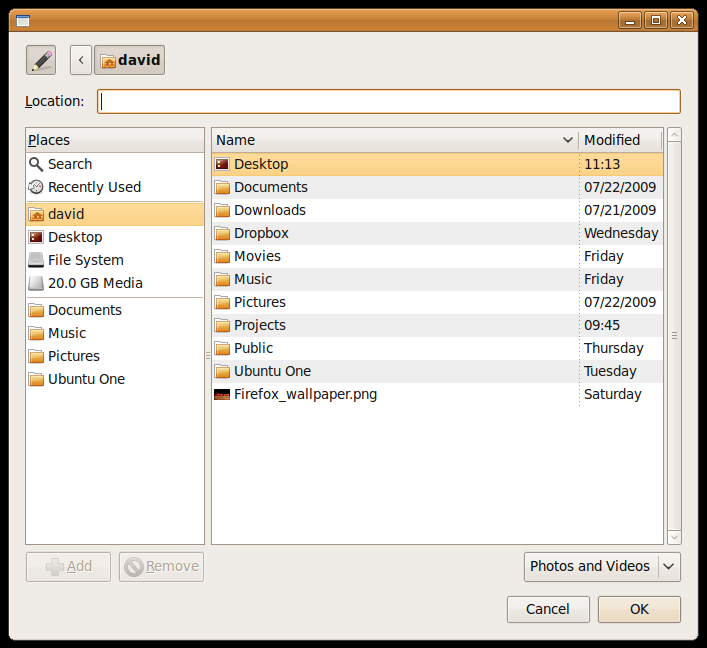 Drawing inspiration from the Open dialog in GIMP, the attached mockup shows the file chooser in the Flickr scenario with file extensions omitted. The extensions should instead be placed in a tooltip (the tooltip should line-wrap to avoid the same problem of being too wide for the screen). The bug was forwarded upstream, and we don't have prominent applications which suffer from this, so we'll leave the fix to upstream. Really? It seems that the flickr file upload experience is pretty prominent. like a very corner case to me. The Flickr example is not the only case, although it is a prime example of the problem. I've encountered this several times in many different situations. It is quite confusing for a new user as it can appear as if the open button is simply missing. Also, users of netbooks will tend to see this more often due to their smaller screens. As Martin Brook said, it actually happens on netbooks. And not only for the dialog width but the height as well, as you can see in the snapshot. So, I suggest to consider both aspects. Would the fix be as simple as having just the type ("Picture or Image File" or "Video File") in the dialog, and having a tooltip pop up that shows the various extensions available in that format? Or would that create a different paper cut (in that people may be used to seeing things a certain way--especially former Windows users)? And this is definitely not a problem only happening in netbooks or systems with low display resolution, if there are enough file types in the filter list (as in the case of the fax-service), then it will also happen on "normal" desktops. Fixed upstream? Holy cow, finally! Please get this in Maverick! This has now been fixed upstream! GTK+ 3.0 and GNOME 3 are approaching and we should get Firefox ready for them. Attaching WIP patch which I've been working on with Martin Stransky. Patch also contain changes from bug #611953 (which are going to be removed in final version). So far with this patch we are able to compile mozilla-central with GTK3, but there is still much work to do (fix exposing issues and couple of crashes). updated version, against trunk, builds and runs. A gtk widget implementation is not finished yet, background is not rendered properly, sometimes crashes. We need to think about how to support gtk2 for a while as well as gtk3. widget/src/gtk2 could be duplicated to widget/src/gtk3. Some of the rest of the code still works with gtk2 I guess. Most of the changes are in widget/src/gtk2/gtk2drawing.c and widget/src/gtk2/nsWindow.cpp, other files may need some clean up only. We still have issues with menu and tooltips and random crashes which Martin is investigating. Also fonts are pink in specific desktop configuration. Have a look and test with your GTK3 and favourite theme. Feedback welcomed. It may be caused by some problem in your config files. I'm just finishing a patch which separates gtk3 code to widget/src/gtk3 and allows to build ff with both widgets so it addresses such issues. Martin separated gtk3 from gtk2 so we now have original widgets/src/gtk2 and new widgets/src/gtk3. He's currently working on plugins (crash when we build with gtk3 and use gtk2 plugin). - fixed drag&drop but it still flicker when moving. Apply patch and build with --enable-default-toolkit=cairo-gtk3. Is the patch diffed against the RC tarball or latest HG? because I couldn't get it to patch against mozilla-central. It would be easier to read the patch if it were split into one which did the duplication and another which made the modifications to the new gtk3 dir. Using "hg copy" would make the duplication easier to follow (and may make splitting the modifications unnecessary). > it to patch against mozilla-central. It is diffed against changeset 62828:b1ef0685b2e0 (mozilla-central from Feb 18). We don't know how to make changes to our local hg repository and stay synced with mozilla-central in the same time. So we unbitrot patch from time to time. > splitting the modifications unnecessary). Hm, I'll check the "hg copy", it looks like good idea. > synced with mozilla-central in the same time. Getting the equivalent of git commit --amend is not quite trivial with mercurial. Most people use the mq extension for this. It sounded a bit much effort to me, but, once I actually tried it, it wasn't so hard to learn. This does come in very handy for separating projects into manageable-sized patches, particularly when each patch in the series is still under development. The gtk2 plugin work at least should be separate from the base gtk3 patch (and perhaps could even be split into a number of smaller patches). I've been doing my best to read the patch since I take particular interest in the native theming portion, but from what I can gather, doesn't GTK3's use of Cairo for drawing widgets mean we can bypass XlibNativeRenderer (and all it's ugly slowness) completely? I may have missed this, but I don't see you setting the enable-system-cairo configure flag by default when GTK3 is built, which can cause nastiness. Sure, the code should be optimized and refactorised. Our goal is to create a minimal working patch and then improve it. > configure flag by default when GTK3 is built, which can cause nastiness. Yeah, we missed that. We use enable-system-cairo option of course, it should be probably part of configure.in patch. It is still there in Natty as well. > It is still there in Natty as well. > file-selection-dialog rather than application specific. > Videos"), and file extension-matching pattern (eg. > long due to the number of file types and mixed-case scenarios (eg. > box can easily grow wider than the user's display permits. > past a certain point to prevent dialog box from growing too large. > Our testing confirms this behavior in both Ubuntu 7.10 and 8.04RC. > upload tool on Flickr.com from Firefox. Make it static inline, like the others. No need for the GDK_DRAWABLE() cast as GdkWindow is the same type as GdkDrawable. I'd prefer to drop the GDK_IS_WINDOW check too. I don't think that adds any value. Fixed. I prefer to keep GDK_DRAWABLE() here, it's the original GTK 2.24 implementation. GDK_DRAWABLE() adds code for an extra function call per caller. The C type cast is pointless because the C types are the same. The GType check-instance is pointless because all GDK_TYPE_WINDOW objects are of type GDK_TYPE_DRAWABLE, and gdk_drawable_get_screen will check GDK_IS_DRAWABLE again anyway. > GDK_DRAWABLE() adds code for an extra function call per caller. Actually two function calls: gdk_drawable_get_type and g_type_check_instance. > > GDK_DRAWABLE() adds code for an extra function call per caller. > Actually two function calls: gdk_drawable_get_type and g_type_check_instance. Only if you don't compile with -DG_DISABLE_CAST_CHECKS which people definitely should do for releases. In that case those casts are just casts. FWIW, using GNOME coding style, I'd make every cast use the macro both because of style ad because I know there's no performance difference, but huge debuggability improvements (once you turn it on). > definitely should do for releases. In that case those casts are just casts. We compile with C flags from pkgconfig, which do not seem to include this. I notice GTK+ does compile with -DG_DISABLE_CAST_CHECKS by default. I don't see any documentation, but it looks like this could only help. Seems a little strange to set an undocumented symbol that would change G_TYPE_CHECK_INSTANCE_CAST to not do what it says it does, but all g_type_check_instance_cast would do for us is print a warning (unless G_DEBUG is in the environment). It doesn't return null if the check fails. It should address the remarks, my comments are at top of the patch. Unnecessary extra white space added in the blank lines. Can you align &attributes with gtk_widget_get_parent_window, please? Fixed comments, ready to commit. >>Don't we want to pass the state flags here? this code is not passing anything for the GtkStateFlags state parameter. > gtk_tree_view_column_create_button()? I don't see it anywhere. >> I assume _NORMAL is the default, so this is unnecessary. I must have pasted something in the wrong place there. about it, if you prefer to leave them in. >>Need to also add gap_loffset here as you did below. > Where the gap_loffset should be? >> Can you add spaces around the "+", please? > Where? All "+" I see have spaces around. The last parameter is correct here, but there are no spaces around its "+". >> gtk_notebook_paint usually uses gtk_render_frame_gap. >> Why choose render_frame over render_frame_gap here? > I can modify it. Uff, sorry for that, I really should build it on gtk2-2.10 box next time. gtk_style_context_get_border uses the state wherever it's available now. > about it, if you prefer to leave them in. I prefer to leave GTK_STATE_FLAG_NORMAL here for now, we can remove it / optimize later. I recall there were issues with rendering when GTK_STATE_FLAG_NORMAL was missing. > render_frame_gap() call for the left half and 0 for the right half. Updated. I hope I grasp the idea correctly. It looks like many (but not all) of the changes between attachment 525346 and attachment 540027 have been reverted or lost in this version of the patch. I don't know whether or not you have a easy way of merging those back in. It may be easiest to go through attachment 533890 again and check that each issue that you addressed is still addressed. > Remove this if it is not used or add a TODO comment explaining why it is kept. > to need, so I'd prefer to stay with that until this is sorted out. >If so, it looks like it should be applied to the TreeView widget. >The only gtk_render_frame I see in GtkScrolledWindow is for the rubber band. > that come from? I would have expected _NORMAL. It doesn't matter, changed to _NORMAL. Some leftover I guess, removed. in patch from comment 122. What would be wrong with using gtk_combo_box_new_with_entry there ? I haven't quite looked at everything you changed here, but most of it, and I'll be on vacation for a week or two, so I'll post what I have. I've been taking too long to get to these, so I've asked Chris to review these two patches. I'll review an updated gtk3drawing patch, as I've got to know that code quite well. >depressed or active) independently of each other. Updated the GetStateFlagsFromGtkWidgetState(), it composes the flags now. > gtk_handle_box_paint also calls gtk_render_frame. regards to the handle_position. But the effective_handle_position() (from gtk_handle_box_paint) uses GtkHandleBoxPrivate which seems to be hidden/private. > in patch from comment 122. > What would be wrong with using gtk_combo_box_new_with_entry there ? I expect that would be the correct widget to use. However, I'm guessing it is not as simple as just changing the widget, but other code will also need changing. That can be sorted out separately. unnecessary anyway because the style context was not changed. The old gtk2drawing code was apparently only painting the box and not the handle. i.e. it didn't call gtk_paint_handle. So perhaps we should drop the gtk_render_handle from moz_gtk_gripper_paint to match that. I don't know where or if this is actually used. Removed the unnecessary save/restore and gtk_render_handle(). The change was made to GTK 3, as Firefox is still a GTK 2 app this issue will remain until the port to GTK3 is finished. I will add the firefox port bug to this bug report. Sorry, as the upstream Mozilla bug has nothing specific to do with this bug report, I'm removing the task, the bug watch can remain though.